A special exhibition remembering the forty five soldiers of Irish descent who were awarded the Victoria Cross for their heroism in World War I has opened in Limerick. 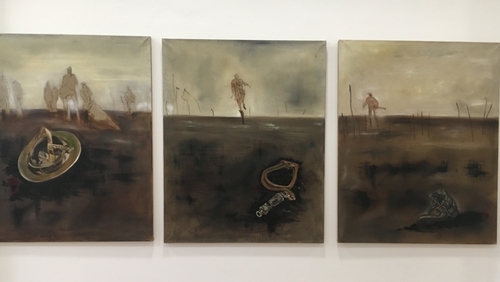 The '45 for Valour' exhibition is the work of artist Trish Taylor Thompson, a graduate of the Limerick School of Art and Design and a former presenter on RTÉ's classical music station Lyric FM. The focus of her work is the importance of remembering, captured in a collection of paintings featuring the globally recognised symbol of remembrance, the poppy, as well as scenes of No man’s land, Flanders fields and the Menin Gate. One of the exhibits at the Limerick Museum features paintings of 45 individual poppies naming and remembering those men from counties across Ireland who were awarded the Victoria Cross, regarded as the most coveted of British military medals awarded specifically for valour. The artist said that during her research for the exhibition she discovered that the Victoria Cross was not awarded lightly. However, Irish soldiers excelled in both bravery and selflessness and made up 12% of the crosses awarded to date. Ms Taylor said the poppies were initially sold as silk flowers to raise money for veterans as a symbol of remembrance. But she says their origins had become embroiled in politics and controversy down the decades and many had forgotten their original intent. One of the '45 for Valour' individuals who fought in the war was Limerick man Michael James O’Rourke, who was a stretcher bearer in the trenches. He was awarded the cross after working fearlessly over three days and nights to rescue comrades from the battlefields. The exhibition coincides with the publication of a book on Limerick's military tradition from 1691-1922 by Limerick historian Matthew Potter, who is Curator of the Limerick Museum. It traces aspects of Limerick's interesting military past, and looks at the many Limerick generals who attained high rank in the British, French Austrian, Spanish and Russian armies. Among them Marshal Patrice de MacMahon, whose great grandfather was Limerick man Patrick MacMahon from Dooradoyle. Patrick MacMahon fled Ireland with the Wild Geese after the siege of Limerick. Marshal McMahon was a notable French general who became famous in the Crimean war and later went on to serve as President of France in 1873.